If you thought that medieval illustrators drew a line in their borderline insanity with little drawings of antagonistic snails being battered by knights, you were sadly mistaken. 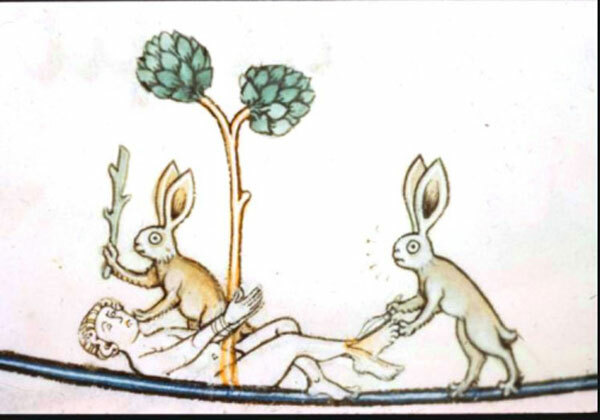 While the snails were getting beaten to a slightly shell-y pulp, rabbits were on the other end of the spectrum; they were having a world of fun brutalising humans in the most bizarre ways. We have rabbits beating men with their bare hands (paws? 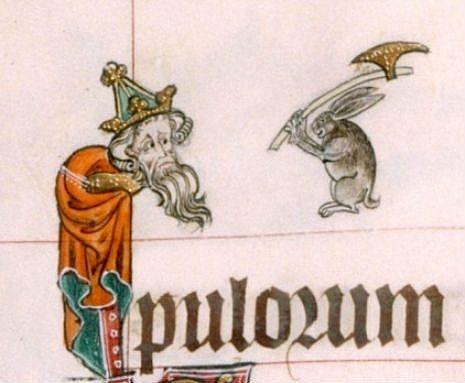 ), we have a rabbit openly beheading a man and then in what has to be one of the most ridiculous historical pictures around, a rabbit mid leap, giant axe in hand, about to violently sever what looks like an old wizard king. Why do we see this recurring theme? And why rabbits specifically? It is thought that these drolleries (the name given to these marginal illustrations), were an instance of irony; an opportunity to reverse the classical ideas about certain animals in a humorously violent way. 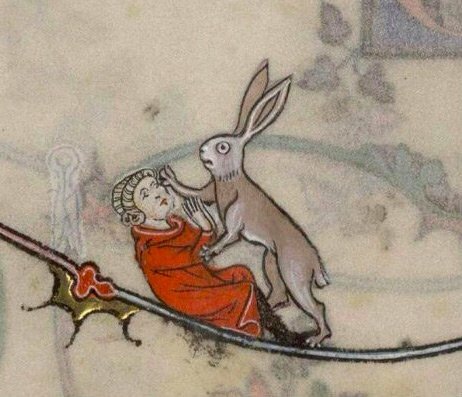 Hares, according to the bestiaries of the time, were considered to be timid, and fast runners. Meek, and arguably at the bottom of the ladder when it came to the classic ‘who would win in a fight’ games that people would play, it made it all the funnier to show a pair of them slap a man around with a stick whilst simultaneously sawing his foot off. Illustrators were apparently amused by the notion of this innocent, passive creature enacting their revenge on unsuspecting humans. This particular image has persisted through the ages, making arguably its most famous cultural reimagining in Monty Python, in the famous Killer Bunny sketch. Students interested in studying History of Art should look at how images persist through the ages, and the importance of visual iconography in centuries past. Students thinking about Theology should look at how the meanings applied to images set a precedent in our cultural understanding of aspects of human nature and God, while those thinking of studying HSPS should look at the anthropology of man’s fascination with drawing.